and is set for a preliminary production of 150,000 barrels. It is very gratifying that a company from the Fatherland has secured a contract to supply various valuable materials for its operation. The engines and boilers have been procured from England and Germany and from the home country of the founders, America. In the past year hops and malt were imported only inmodest quantities, as the production of a single brewery (the Imperial Brewery) meet only a small sale. Since, however, the nascent second, much larger brewery, Oriental Brewing Co Ltd, is reportedly expected to be operational inthe course of 1908, a brisker demand for these two articles, in which our monarchy is undoubtedly competitive, will soon manifest. There were rumours of yet another start up in the spring of 1908, when the British Beer Brewery was reported to be planning to establish branches in Singapore, Batavia, Bangkok and Hong Kong. (40) In the end, however, only the Singapore branch seems to have been built, opening late in 1908 and brewing Pilsen and Munchen lagers, and stout. Hocking returned to Honolulu in 1910. 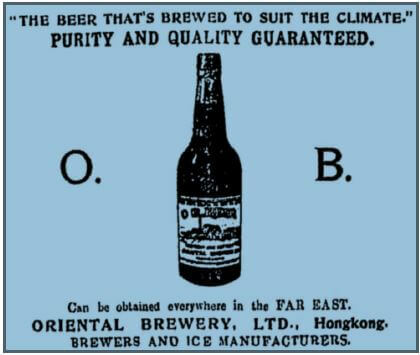 Early in 1911 the Oriental Brewery’s beer was on sale in Singapore, 1,600 miles away,(42) where those with a ‘plebian taste’ were recommended ‘the excellent brands of the Oriental Brewery of Hongkong, who set themselves out to suit the Far Eastern taste in beer’. Its advertising slogan was ‘The Beer that’s Brewed to Suit the Climate’, and one of its brands was ‘Prima’, echoing the Honolulu brewery’s Primo brand. (43) The brewery had a visit from a group of tourists staying at the King Edward Hotel in March 1911, ‘the first time that a direct attempt has been made to interest passing visitors in Hongkong’s industries’, according to the Hongkong Telegraph, which added: ‘We hope the practice will become more general’. The whole business was put up for sale by the receiver early in January 1913, as a going concern. (45) It was described as ‘the finest and most completely equipped Brewery, Bottlery and distilled Water Ice Manufacturing plant in the Orient’, a two to four-storey building and two two-storey godowns (warehouses) sitting on a site 1,015 feet long and 175 feet deep. The equipment included a 150-barrel (American measure) copper kettle, a bottling plant capable of filling 80,000 bottles a day, corking and crowning machines, and 1,100 oak barrels, as well as two steam launches, the Aloha, 65 feet long, and the Oriental, 75 feet long, which came with an insulated hold ‘for handling Ice, Beer and other cargo’. Early in May 1913, rumours started circulating in Hong Kong that the brewery had been purchased by a firm in Manila. Arratoon Apcar, whose family were originally Armenian merchants, via Bombay, insisted to the Hongkong Telegraph that there was ‘no truth whatever’ in the reports, and he ‘cannot imagine how the story got out’. (47) Just a week later, however, it was announced that the brewery plant had, after all, been sold to a syndicate from Manila, led by Antonio Barretto, cousin of ‘Don Enrique’ Barretto, the man who founded the San Miguel brewery. The Barretto syndicate had the Oriental Brewery’s equipment dismantled and shipped from Hong Kong to the Philippines. 34. Hongkong Daily Press. 15 May 1908. p.2. 35. China Mail. 2 May 1907. p.5. 36. Straits Times. 8 February 1907. p.6. 37. United States Department of the Interior National Park Service National Register of Historic Places Inventory Nomination Form for Alfred Hocking House. 30 October 1984, at pdfhost.focus.nps.gov/docs/NRHP/Text/ 84000246.pdf, downloaded 15 April 2012. 38. Michigan Manufacturer and Financial Record. (1913) Vol 10, No. 20, 17 May 1913. p.34. 39. Goetz, F. (1912) ‘A Dissertation On Brew House Machinery’, Report of the proceedings of the Second International Brewers’ Congress held at Chicago, 18-21 October 1911. Vol. 1, p.619. 40. Singapore Free Press and Mercantile Advertiser. 29 May 1908. p.5. 41. Industrial Refrigeration, pub National Association of Practical Refrigerating Engineers. (1910) Vols. 38-39, September. p.132. 42. Singapore Free Press and Mercantile Advertiser. 31October 1911. p.5. 43. Hongkong Telegraph. 28 March 1911. p.5. 44. Hongkong Telegraph. 1 October 1912. p.5. 45. Straits Times. 9 January 1913. p.16. 46. Straits Times. 4 March 1913. p.8. 47. Hongkong Telegraph. 7 May 1913. p.1. 48. Hong Kong Daily Press. 15 May 1913. p.3. This article was first posted on 11th April 2016.